Dr. Current graduated from Appalachian State University with a B.S.B.A. Degree. 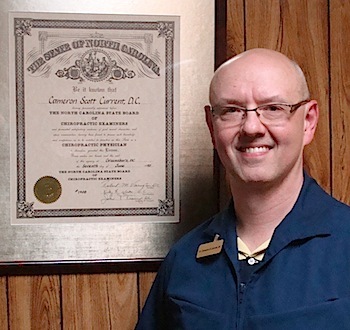 He received his D.C. From Life Chiropractic College where he graduated with honors in 1992. He also has a Fellowship from the International Academy of Medical Acupuncture. He serves as a deacon and pianist at West Jefferson First Baptist Church, is active in Relay for Life, and is involved in the Ashe County Little Theatre. Cameron enjoys teaching aerobics at Littles Health and Fitness in West Jefferson and Mountain Hearts in Jefferson. Joyce, wife of Dr. R.W. Current has worked in many aspects of the practice. She is a licensed massage and bodywork therapist specializing in hot stone massage and cranio-sacral technique. She is involved with many community organizations.